Sticky and tender these grilled chicken wings are perfect party fare! Put the chicken wings in a large stock pot. Add enough water to just cover the wings. Set the pot on the stove over high heat, uncovered and bring to a boil, reduce to a low boil for 10 minutes. Remove and drain well. Parboiling keeps the wings succulent and tender, not dry! This is easy and sooo much better than deep fried! While the wings are cooking, mix together the Wings Sauce Glaze in a large bowl, set aside. Also mix together the Dipping Sauce. Broil or grill them for about 6-8 minutes on side one. brush them with more sauce, flip, again adding more sauce and broil side two, about 7-8 minutes or until they have great caramelization. 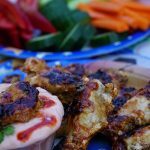 Serve with the Mango Dipping Sauce - next.....sit down in front of the TV with a big platter of wings and enjoy watching the game!